Admittedly, I’m one of those people whom this book is geared for. I’m shy about legal research, believing myself to be utterly unqualified. I only vaguely understand what I call legalese. Sure, I spent quite a bit of time using Lexis when I wrote a paper for my copyright class, but I know that I am absolutely still not qualified for any sort of law librarian job. Anthony Aycock’s The Accidental Law Librarian book proved me wrong. Sort of. I still feel unqualified, but at least if I, erm, accidentally become a law librarian, I won’t be entirely lost. To be honest, I approached this book with a skeptical attitude. I should have been more open minded, but I had a feeling that it would either be too dumbed-down and condescending, or it would be too obfuscated with legalese and out of my league. Aycock strikes that tricky balance between keeping it simple and not making me feel stupid. He provides explanations for legal terms (now I understand what Shepardization is! ), essential background information for trends in the legal world (like the rise inpro se representation), basic rundowns of the pros and cons of various legal databases, and lots of links to resources that expands on subjects addressed in the book. And slowly, as I read the book during my commute over several days, my stubborn skepticism about the book wore down. It actually is useful. At least for a few years. That’s one of the drawbacks of such a book like this–information changes so quickly. No doubt updates will be needed before long as databases add more search features, websites change, and newly graduated lawyers have different expectations about information. That’s why I’m relieved he has a website with resources, so hopefully the links will stay accurate. The skills he shares here about searching, though, are timeless. He shares many of these tips through anecdotes–like the importance of listening carefully to patrons, and gathering the keywords from reference questions to find clues about how to approach database searches. I finished the book actually feeling like I’m capable of doing legal research. Maybe not a law firm library, but at the very least, I got some extremely useful searching tips to help people answer the basic legal questions. I certainly do recommend this book not just for law librarians, but also for public or academic librarians who have to answer a wide range of questions, including legal questions. Do I recommend it? Absolutely yes. Especially for those of us who are recent MLIS graduates who want to keep on learning without paying for more classes. Disclaimer: I got a free and advance e-book copy of this book from Information Today, Inc. I was not required to provide a good review, and I’m getting no other remuneration for this review. Except for my newfound confidence about legal research which might help me land a professional job down the road, in which case it’s a delayed, indirect remuneration. This entry was posted in Cheap Tools for the recent MLIS Graduate. Bookmark the permalink. Thanks for this review – it was very helpful, and makes me want to read the book. As an experienced law librarian (and lawyer), I think it’s great that reading this book has given you a new confidence in your abilities, and that you also are aware of your possible limitations. I wonder how an experienced law librarian would review the book. (I’m going to search for other reviews now.) Thanks again for sharing with us. I would be curious to see what you and other experienced law librarians think about it–please feel free to share a link if you write one or find a good one elsewhere. 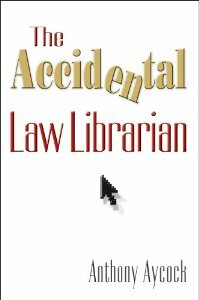 I’d be more than happy to send you a review copy of The Accidental Law Librarian. If you want to review it, please contact me at rcolding@infotoday.com. [That is if Holly is OK w/ publishing my email address.